Last night’s episode of “The Bike Show“, aired on London’s Resonance FM, featured an extended interview with your’s truly on the subject of OpenStreetMap and my OSM cycle map. The interview was recorded out and about around London a couple of weeks ago – and if you want to listen to it, it’s available on their website – “Reclaim the Street(maps)”. Also on the programme was a short interview with George Coulouris and Jean Dollimore from the Camden Cycle campaign. We’ve been collaborating over their mapping website, maps.camdencyclists.org.uk, to use my cycle maps as the backdrop to their routes, and you can switch from Google to OSM using the drop-down in the top right corner of their maps. So those of you paying attention to the interview will know who finished off the LCN 22 a couple of weeks ago! This entry was posted in Uncategorized and tagged OpenStreetMap on February 5, 2008 by Andy. No, thankfully not a direct reference to my week of snowboarding, but the “bleeding edge” is a techie term for being so close to development that things go wrong as often as they go right. Which is more or less how the cycle map has been over the last fortnight. Dave has bought new bits and pieces for the infamous “beerwarmer”, the server that does all the work behind the cycle map, and written lots of clever code to take advantage of the quad core processor – to the point where 726,795 tiles takes only 1hr29m to render. But the biggest improvements have been in the mapnik rendering library, making great improvements to the text placement handling and semi-transparent layering options. I’ve no idea whether people will notice things like cycle shops and toucan crossings now showing above the route highlights (see Putney for example), or much better displaced-text (see Stockholm) but it’s the little things that improve the quality, and with the recent work we’ve been doing with the mapnik developers there’s now many more bits of polish that can be applied. There’s yet more areas added to the cycle map, including Trondheim in Norway and Bern in Switzerland. As ever, if there’s anywhere else in the world that you want rendered, please let me know. I try to keep an eye on where national cycle routes are appearing, but I don’t always notice all of them. And my snowboarding trip didn’t go unnoticed – a few worried people piped up on the mailing list to enquire what was going on with the lack of updates – no rest for the wicked! 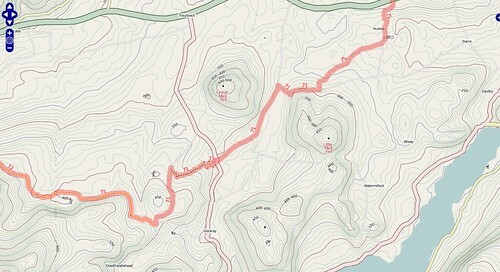 This entry was posted in Uncategorized and tagged OpenStreetMap on February 3, 2008 by Andy.